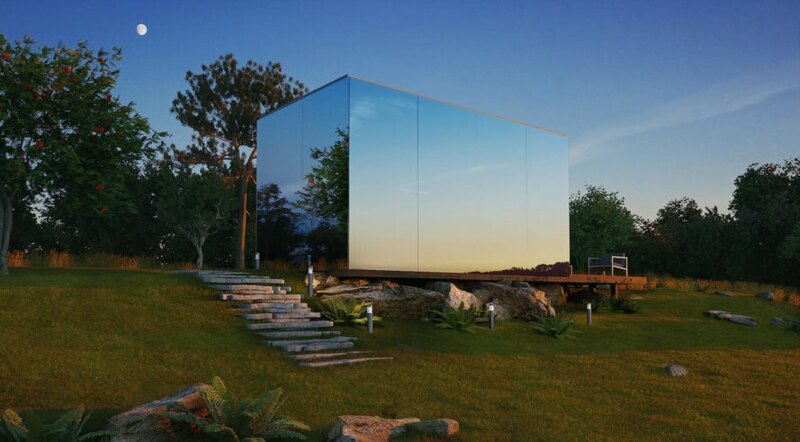 Meet ÖÖD, a gorgeous prefab abode that doesn’t compromise privacy for stellar views. 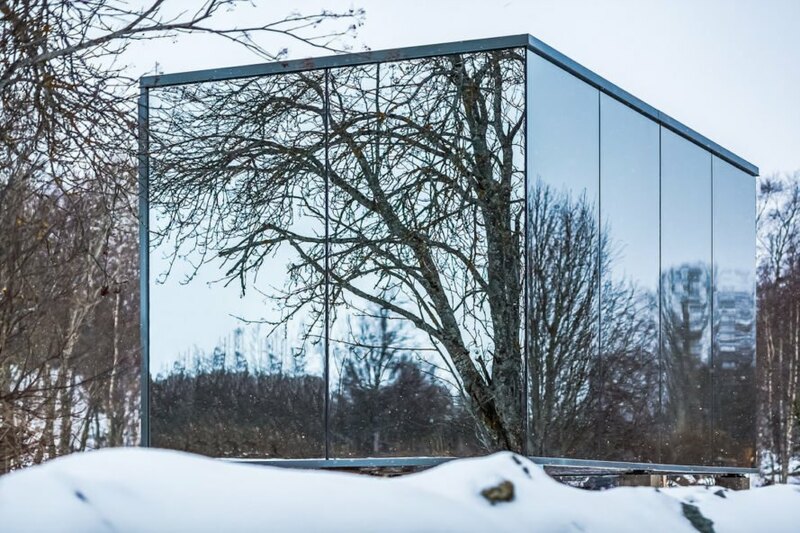 Clad in mirrored glass, this sleek tiny home blends into its surroundings and offers all the living essentials built into a compact 18-square-meter footprint. Designed primarily for use as pop-up hotel rooms, the moveable and modular ÖÖD has far-reaching applications and is even under development for off-grid solutions. Designed and manufactured in Estonia, the ÖÖD houses were specifically developed for hotel usage and holiday housing. Its small footprint allows for easy installation anywhere in Estonia without the need for a building permit. Each unit accommodates two to three people and can be slotted seamlessly into urban and rural landscapes. 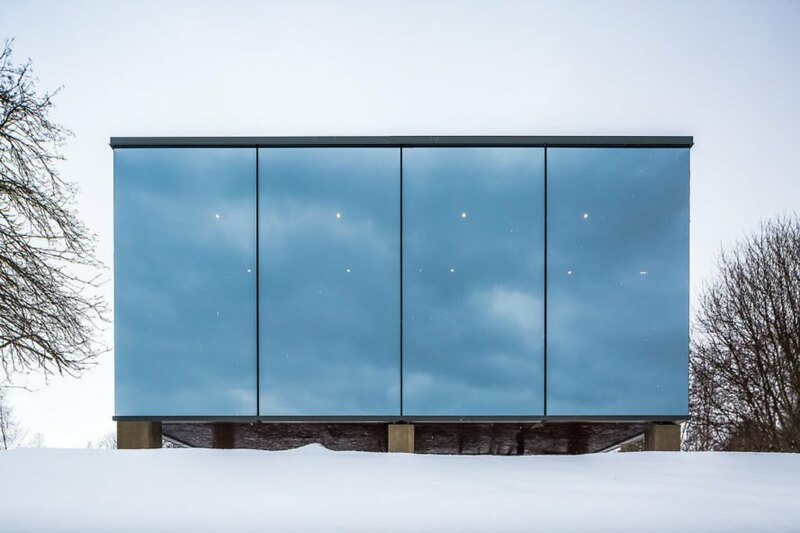 Built primarily from steel, insulated glass, and thermally treated wood, the ÖÖD home features a studio layout with a large custom-made bed, kitchenette, living area, and bathroom. Home automation is built in as is adjustable floor heating and LED lighting. Homeowners would only need to hook the unit up to an Internet cable, water, sewage, and an electricity supply though off-grid solutions are currently being developed. An LG heat pump with moisture separator provides heating and cooling. Installation of the ÖÖD only takes eight hours to complete. The units include custom-built Estonian furniture. 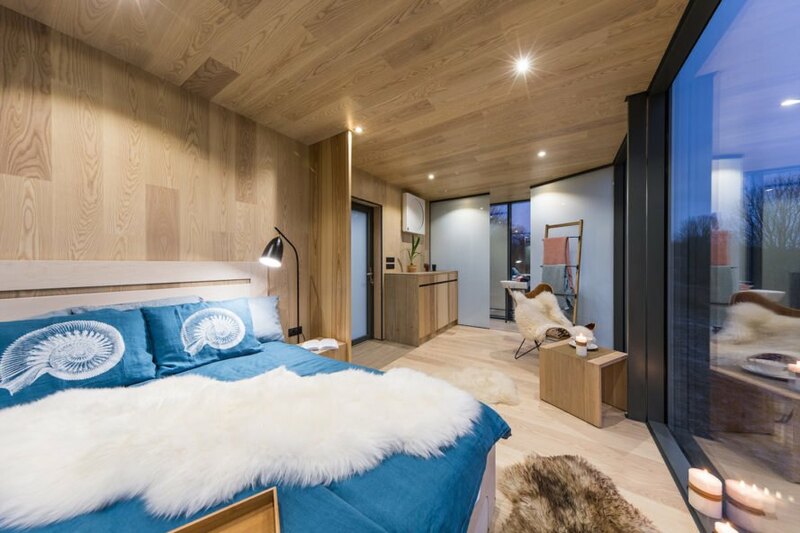 ÖÖD homes have only been installed in Estonia thus far—the first unit debuted last fall—but the company plans to expand to international markets. Pricing has been updated to $65,000 per unit. Absolutely stunning!! We love this style here at "www.lucasrichard.ca" !!! Those aren't passive houses? Are they? 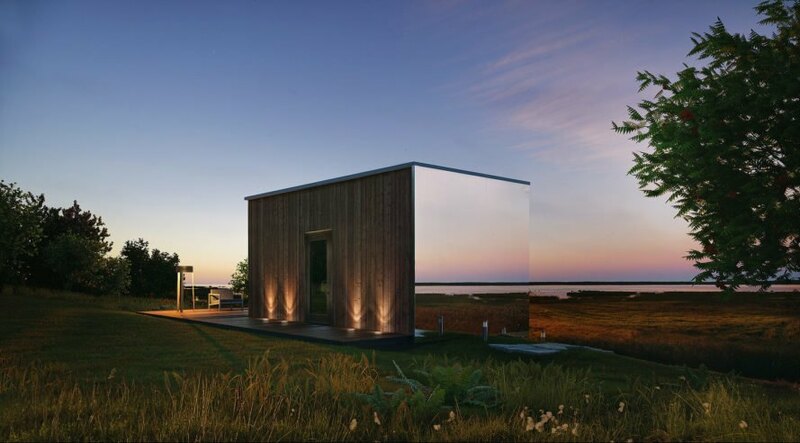 Designed and manufactured in Estonia, the ÖÖD houses were specifically developed for hotel usage and holiday housing. Its small footprint allows for easy installation anywhere in Estonia without the need for a building permit. Each unit accommodates two to three people and can be slotted seamlessly into urban and rural landscapes. 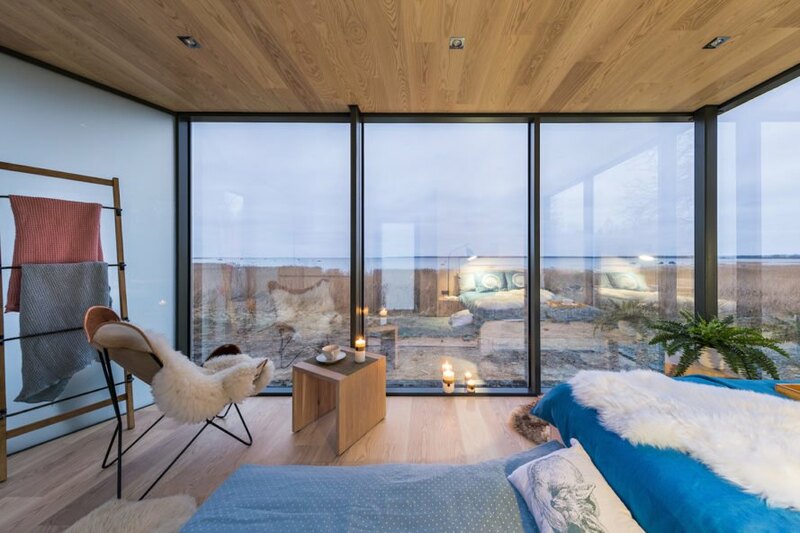 Built primarily from steel, insulated glass, and thermally treated wood, the ÖÖD home features a studio layout with a large custom-made bed, kitchenette, living area, and bathroom. Home automation is built in as is adjustable floor heating and LED lighting. Homeowners would only need to hook the unit up to an Internet cable, water, sewage, and an electricity supply though off-grid solutions are currently being developed. An LG heat pump with moisture separator provides heating and cooling. Installation of the ÖÖD only takes eight hours to complete. Each unit costs $65,000 and includes custom-built Estonian furniture. ÖÖD homes have only been installed in Estonia thus far—the first unit debuted last fall—but the company plans to expand to international markets.